Late last year, one of my greatest 'discoveries' of 2018 were the products from USA-based Tactile Turn. Having been around for a number of years, Tactile Turn is not a new player to the market, but I somehow held off on their products until recently. As soon as I got my hands on one of their Gist fountain pens, I knew I'd also have to try their other products! 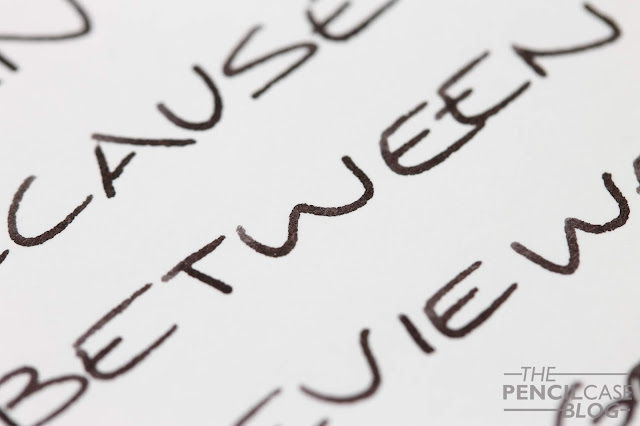 Recently, I reviewed one that quickly became a personal favorite: the Glider (review HERE), and today we're taking a look at one of Will's earlier creations: the Tactile Turn Mover pen! 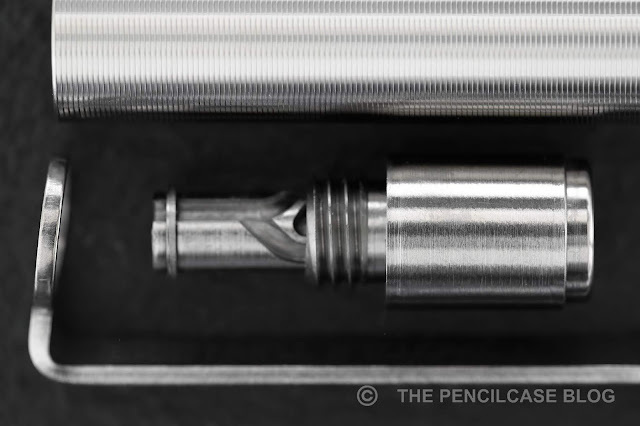 The Kickstarter for the Mover (and accompanying, slightly smaller version: the Shaker) dropped way back in 2014, and business really took off for Tactile Turn from there, turning Will's one-man endeavour into a serious machining company with strong roots in the EDC pen and gear community. The Mover is a fairly quintessential EDC pen in terms of design. All of Tactile Turn's products share a very similar design language, but this one actually used to be a little different from the rest before Will decided to 'unify' his design language/aesthetic across the board in all his products. The Mover and Shaker were 'revamped' back in 2017 with a new solid titanium, made-in-house knock mechanism and an updated finish where the 'tactile' spiral-grooved texture now runs along the entire length of the pen. 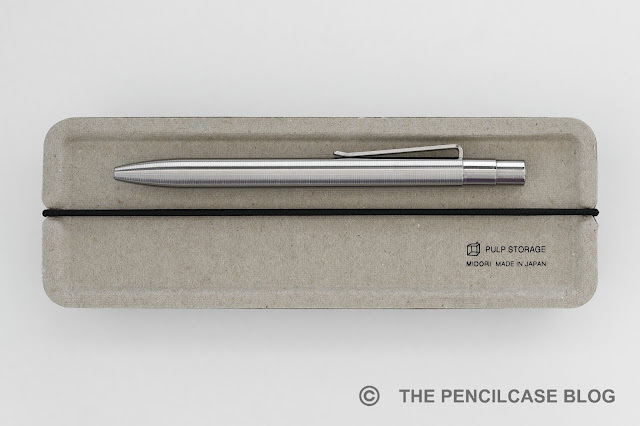 The Mover/Shaker has a noticeably simpler and more minimal aesthetic compared to the Glider/Slider and mechanical pencil. 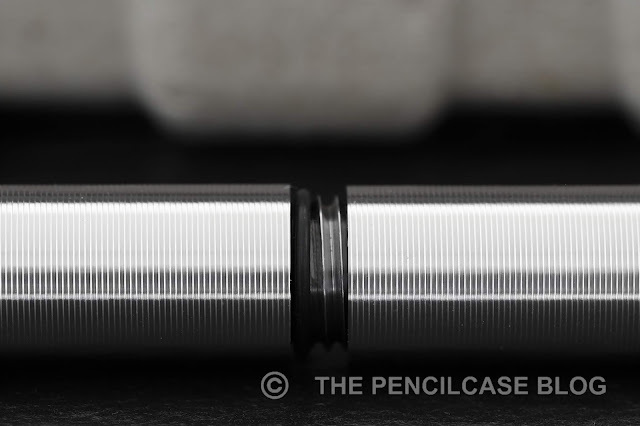 This has a lot to do with the simple, no-frills knock mechanism at the back (instead of the more intricate bolt action mechanism on the mechanical pencil and Glider/Slider). It's a very straight cylindrical design, with a strongly tapered nose cone. The industrial-looking stainless steel clip is another constant across all Tactile Turn products, and is very stiff but functional. Talking about the mechanism: Tactile Turn machines their own in house, and uses titanium instead of the usual brass Schmidt knock mechanisms that apparently tend to break after extended use. I personally haven't had any issues with the Schmidt mechanisms, but it's nice to know that TT went the extra mile anyway to ensure the pens' longevity. The knock is a bit less smooth because of the titanium-on-titanium friction, but it functions as good - if not better- as the Schmidt, and it looks nicer while at it. The Mover/Shaker doesn't draw much attention in terms of design. It's a pen you might easily overlook, although that's not necessarily a bad thing for an EDC pen. 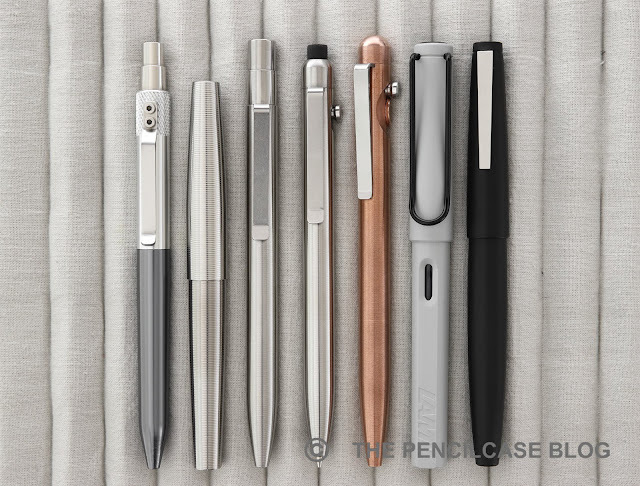 It's the little things that make this pen excellent: such as the custom knock mechanism, but also not in the least the trademark textured tactile finish and sturdy stainless steel clip that are consistent across all Tactile Turn products. Machining is precise and clean, with high tolerances. The almost invisible break between barrel and section is a testimony to the quality, which makes the entire pen feel like a unibody design. I was sent the titanium version to check out, as this is Will's personal favorite... and I can't blame him! 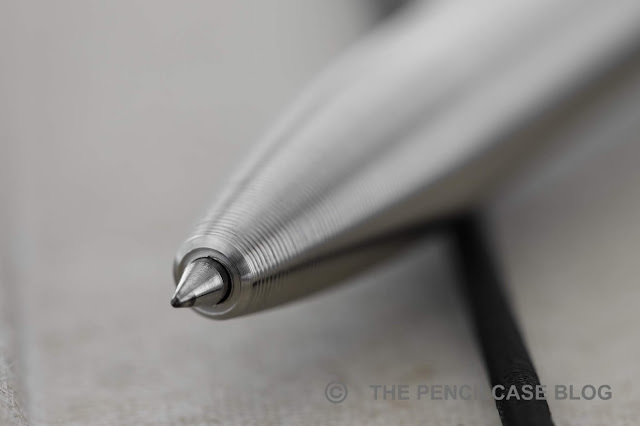 Titanium usually lends itself perfectly for making pens: It's lightweight, durable and looks good too. In this case, the Mover only weighs 34 grams, only half the weight of the copper Glider I looked at earlier, yet still substantial enough to feel solid in the hand. The Mover is a sizeable pen at 14cm (5.5"), while its smaller brother (the Shaker) is about half an inch shorter. It's a fairly average 11mm in diameter (0.43"). The all-titanium construction is balanced in the hand, and the texture adds a fair bit of grip. About that texture: the machining seems to feel a bit 'sharper' and grippier on this titanium pen than it is on the copper Glider, but not in an uncomfortable way. As with the Glider and Slider, the only difference between the Mover and Shaker - apart from their size, of course - is the refill they are built around. The Mover comes loaded with a fine (0.38mm) Pilot G2 refill in black, while the Shaker takes Parker-style refills and comes loaded with a Schmidt Easyflow 9000 (as far as ballpoints go, an excellent refill). I like that Tactile Turn chooses the narrower 0.38mm refill instead of the more standard 0.5mm. It lays down a crisp, fine line and has somewhat less tendency to smear. 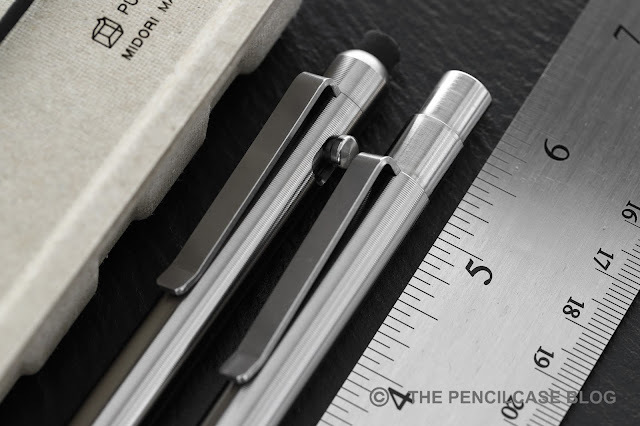 The Mover is - especially from a design point of view - a simple EDC pen. But at the same time the devil is in the details, and Tactile Turn gets a lot of those details very right. Made from solid titanium, it's sturdy, balanced and good-looking. 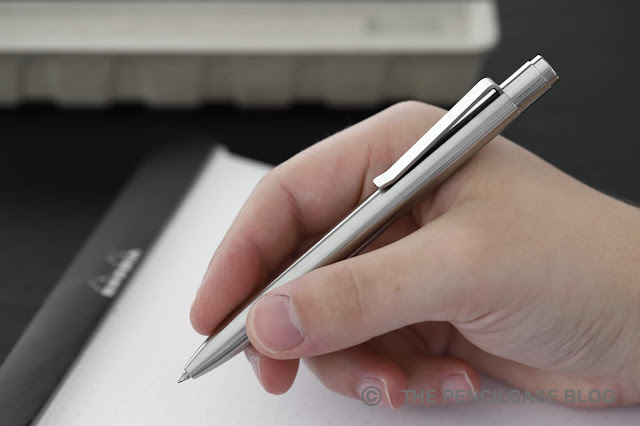 The upgraded knock mechanism adds to the durability, and Tactile Turns' trademark tactile finish makes this one of VERY few metal pens that actually provides a solid grip. Even though the cusdtom titanium mechanism adds to the cost, TT still manages to keep pricing relatively low compared to comparable competition. An aluminium Mover or Shaker will set you back 69$, whereas an all-titanium version like this one comes in at 99$. 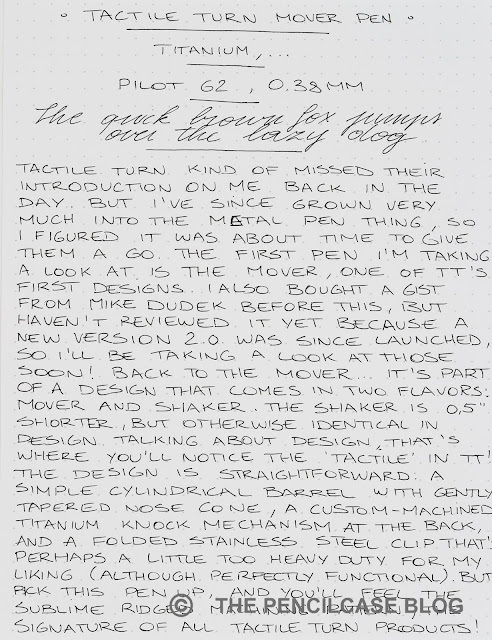 This product was provided by Tactile Turn, so I could write this review. I was in no way influenced in the making of this review, the opinions shared in this review are completely my own! This post does not contain affiliate links. The above discount code will give you 10% off your next order! 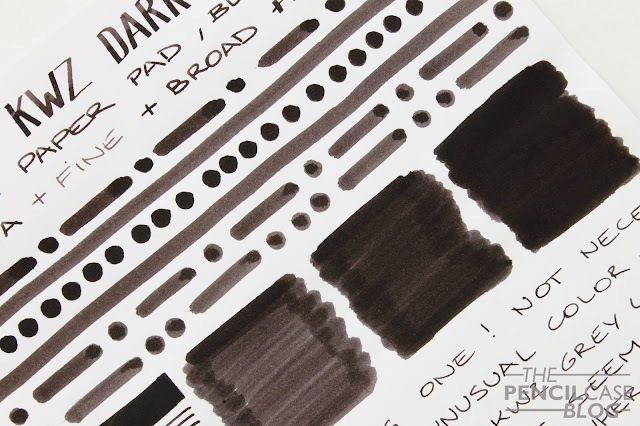 I admit, I tend to gravitate towards darker, more muted inks. Quite simply because they are the most convenient choice for everyday use. 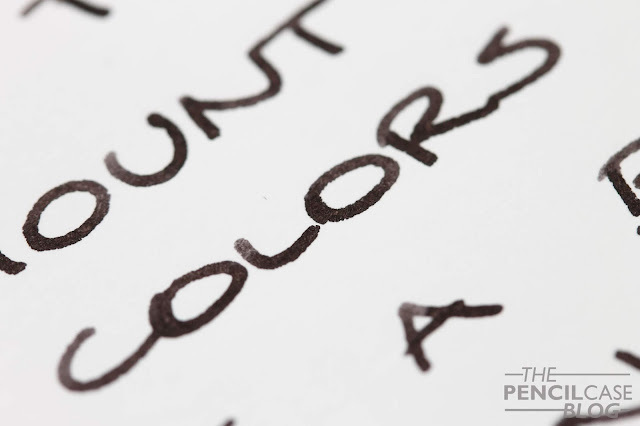 I love to play around with fun and exciting colors that burst with sheen, shading and what not... but when you need an ink to take notes in class, or fill out an important form or test, that hot pink with flashy green sheen probably isn't the most convenient choice, right? 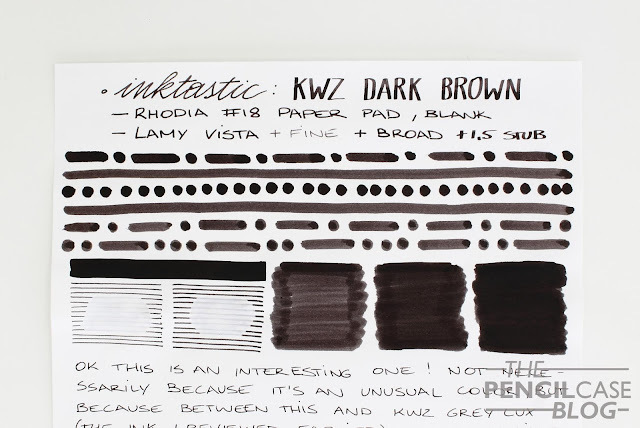 KWZ Dark Brown, on the other hand, is one of those colors that is constantly in my daily use rotation. It's close to -boring- black, yet still different. It has the slightest amount of color variation to it, somewhat of a cocoa brown hue (but dark and with very low saturation). It shades a bit, but the dark base color makes it hard to see in most written samples. 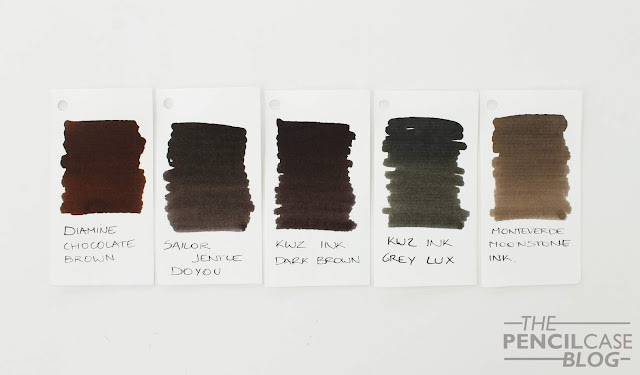 In short: it's a perfect subdued color for everyday use. 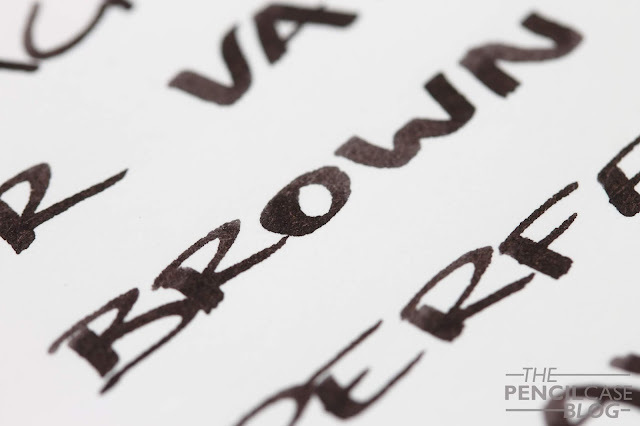 It's a smooth and lubricated ink (as I find most KWZ inks tend to be) and has a nice flow in most pens. It's ever-so slightly prone to feathering, although it only really becomes an issue with cotton swabs or very wet applications with broad dip nibs. In regular use it's behaved just fine. 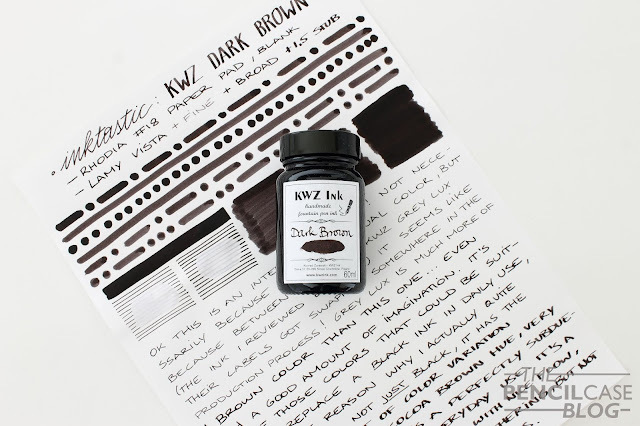 KWZ Dark Brown retails for 12€ (15$) for a 60ml bottle. It leans dangerously close to black, but adds a sliver of warmth and character with its' subtle brown hue. If Dark Brown is a bit too... brown for your taste, some of my favourite alternatives are KWZ Green Gold, Cappucino and Brown-Pink. They are a bit more colorful, but still very much suitable for everyday use. Note: Casa Della Stilografica is a sponsor of this blog. I received this product free of charge. I was in no way influenced in the making of this review, the opinions shared in this review are completely my own! This post does not contain affilate links.